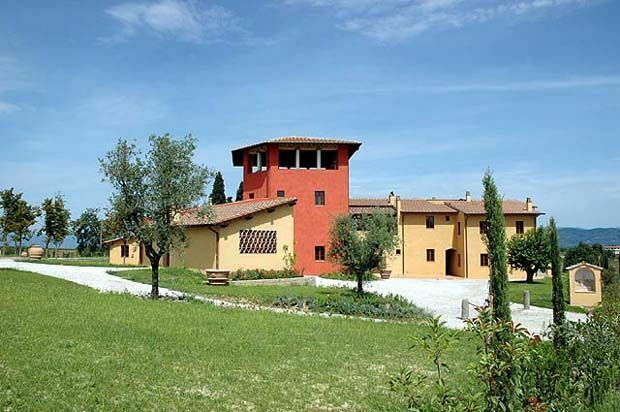 Nice accommodation near Montecatini, a residential complex set in a 30-hectare estate deeply plunged amidst the green hills surrounding the small town of Cerreto Guidi, affording beautiful views over the surrounding landscape. Thanks to a skilful restoration work aimed to preserve its original architectural features, this ancient accommodation near Montecatini has been turned into 14 nice apartments, a restaurant offering excellent local recipes and a small wine bar where local wines and olive oil are available for tasting. On the premises it is also possible to visit a small museum exhibiting ancient farming technologies as well as modern cultivation and wine-making methods. Distances: Cerreto Guidi with all kinds of shops 2 km, the charming medieval town of Vinci with Leonardo da Vinci museum 7 km, Montecatini with nice spas approx. 20 km, Florence approx. 40 km, Pisa approx. 60 km. Siena and San Gimignano are within 40 km. The access to the property is via an unpaved but well-maintained road. At guests’ disposal: large furnished garden, swimming-pool (7 x 14 m – maximum depth 1,95 – open from 01/05 to 30/09). Parking within the grounds: Shared laundry. All of the 14 apartments are nicely furnished in a rustic style and are provided with satellite TV, telephone, hairdryer, air-conditioning (to be paid locally depending on the use). Extra services: Maid service available by arrangement (payment on the spot). Baby bed available on request (to be paid on the spot). Two meeting rooms offering nice views over the surrounding hills are available on request. 40 m2. Ground floor: living-room with kitchen corner (freezer) and double sofa-bed, twin-bedded room, bathroom with shower. Patio furnished with table and chairs. Apartment suitable for disabled people.